Results of the "Tokyo no Shiten 東京の視点 Tokyo Perspective" Call for Scores. We are honored to present the premiers of these compositions on the "Tokyo to New York " concerts in Tokyo and NYC during 2014-2015. Clarinetist and Hichiriki player Thomas Piercy is calling for one-minute pieces composed for Clarinet or Hichiriki and Piano or solo Clarinet/Hichiriki to be premiered in NYC and Tokyo on a “Tokyo to New York” concert during the 2014-2015 concert season. The theme of this call is “Tokyo no Shiten 東京の視点 Tokyo Perspective.” The “Tokyo no Shiten 東京の視点 Tokyo Perspective” compositions should be inspired by the composer’s thoughts or feelings about Tokyo; inspired by the musical arts of Japan or Japan’s visual arts (either traditional or contemporary); or pieces using technical elements found in Japanese music. Works should be composed specifically for this project. All pieces must be premieres and not previously performed. The results will be announced in July on the Tokyo to New York website, and composers of the works selected to be performed will be notified by email. - Deadline: July 15, 2014. - Open to all composers living in the greater NYC metropolitan area. -Works written for Bb clarinet or Hichiriki and piano OR Bb clarinet / hichiriki solo. If you wish to compose for the HICHIRIKI, please consult by e-mail with Thomas Piercy before making a submission. - All works must be 60 seconds or less in length. - There is no fee to submit. - All techniques (except prepared piano) and styles are accepted as long as it fits within the theme above. - Works should be composed specifically for this project and performer. - All pieces must be premieres and not previously performed. - Works must be submitted as a PDF file. - The score must be submitted as an attached PDF file. - Send score, parts, performance notes and photo together in one e-mail. - Scores with the Bb clarinet line transposed are greatly appreciated. - The email must include the composer's picture as an attached jpg file. - Include a 50-word biography and up to 50 word program note. - Include your contact information in the text of the email: name, address, email, phone number. "Tokyo to New York Concerts" celebrates the connections between Tokyo and New York City. as well as traditional Japanese instruments including the hichiriki and shakuhachi. The "Tokyo to New York" 2013 concerts included fourteen World Premieres and fifteen United States premiers. The "Tokyo to New York" 2014 concerts have included twelve World Premiers and sixteen Japan premiers. "Tom Piercy’s Richly Diverse Program of Japanese and American Music"“ "…..a fascinatingly eclectic, virtuosic program of new chamber works which contrast Japanese composers’ views of New York with their New York counterparts’ views of Japan. Although most of the works are relatively short,….the ensemble tackled the music’s wide range of demands with verve, insight and sensitivity." Click here for "Tokyo to New York" 2014 Concert Info, Photos, Reviews and Audio. Click here for "Tokyo to New York" 2013 Concert Info, Photos, Reviews and Audio. Thomas Piercy is a critically acclaimed musician with orchestral, concerto, solo and chamber music appearances throughout the Americas, Europe and Asia. His performances have been described by critics as "passionate," "pulling out all the stops," “the best Piazzolla in NYC,” and by the New York Times as “brilliant,” “playing with refinement and flair” and “evoking a panache in the contemporary works.” He studied at the Juilliard School and Mannes College of Music. He studied clarinet extensively with the English clarinetist Gervase De Peyer; additional studies were with Kalmen Opperman and Leon Russianoff. 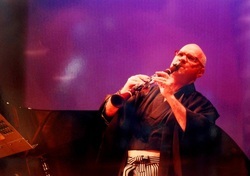 He has studied the traditional Japanese instruments hichiriki and shakuhachi while living and working in Japan. A versatile artist defying categorization - the clarinetist on the Emmy Award-winning Juno Baby CD and DVDs; performing Mozart with mezzo-soprano Frederica von Stade; playing Broadway songs with Raoul Julia; working with the composer Leonard Bernstein; appearing in a KRS-ONE rap music video; performing concert improvisations with jazz pianist Donal Fox; premiering new works; recording with members of Maroon 5 - as an instrumentalist, he has performed and recorded for Broadway and Off-Broadway, commercial recordings, television, radio, videos, and movie soundtracks. Mr. Piercy has performed at many acclaimed concerts halls including Carnegie Hall, Lincoln Center, the Kennedy Center, the Dame Myra Hess Memorial Concert Series (Chicago, Illinois), Centre Pompidou (Paris, France), Wigmore Hall (London, England), Accademia di Santa Cecilia (Rome, Italy) and Parthenon (Tokyo, Japan). He has performed several times at the International Clarinet Festival, the world's largest annual gathering of noted clarinetists, including a concert in memory of Leon Russianoff, a concert of contemporary American music in Japan, and an all-Piazzolla program. He has performed and premiered over 150 contemporary pieces written for him, including Grammy Award-winning and Pulitzer Prize-winning composer Ned Rorem only piece for clarinet and piano. He has had arrangements and transcriptions published by Boosey & Hawkes, and contributed to clarinet study books and clarinet compositions published by Carl Fischer, Inc., and Baron Publishing. Recordings available on such labels as the Albany, Capstone, Changing Tones, DGA, NJSF and Tonada labels.